When I was 14 years old my mother set-up Family Tree, a pre-school unit conducting research into infantile autism. Family Tree was situated next to our home and I was invited to help choose the furniture, the toys and Montessori equipment. During the school holidays I would go into the unit to paint with the children. Their ages ranged from 18 months to 8 years old, and just like at home, where I would be co-opted to occupy my younger siblings in artwork, at Family Tree I was assimilated into art therapy practice most naturally. My involvement in Family Tree continued throughout my first degree in education, art, drama, and special needs. In addition to working alongside art therapy students on placement at Family Tree, we had an array of stimulating visitors who came to observe and learn about our work, based on psychoanalytic psychotherapy coupled with ethological approaches – Prof. Niko Tinbergen, Prof. Michael Rutter, Dr. Frederik LeBoyer, Simon Baron-Cohen et al – in addition to our weekly supervision with Frances Tustin. While June Felton, my mother and director of Family Tree, spoke about the osmotic communication between mother and autistic baby, I believe I picked up much of my learning by osmosis, in a kind of parallel, parallel process. Since qualifying as an art therapist I have worked with many client groups. In my private practice I see children, adolescents and adults. I have a particular interest in adult mental health having previously worked for 6 years at the Arbours Crisis Centre – a therapeutic community for adults struggling with severe mental health issues. I still work with children and adults on the Autistic Spectrum. As a clinical and student supervisor I see art therapists and artists working with deprived youth in primary and secondary schools. The Art for the Heart workshops, which have been running as a slow-open group since 1999, evolved out of the general interest of members of the public who wanted to engage in a reflective art process. I run many teaching and training workshops and enjoy the challenge of developing a dynamic programme and working with new groups. Have taught in the UK as well as run trainings in Germany, Greece, India, Japan and South Africa. 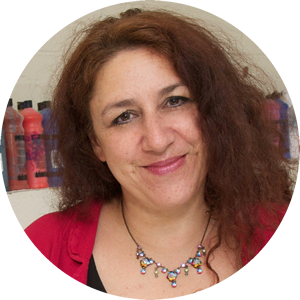 As an active educator I am involved with developing art therapy education, conferences and workshops; as Director of London Art Therapy Centre I coordinate our monthly clinical meetings and integrative supervision group. I view these different approaches as having different roles to play within the therapeutic container: they may inform or offer a system of practice or be used exclusively depending on the context in which the therapy takes place. However art therapy is far more than the therapeutic orientation. It introduces a third dynamic – the creative act – which for me is a primary process in the healing journey.